The Federal Communications Commission voted 2-1 to begin the process of reversing the Obama administration's net neutrality rules. Chairman Ajit Pai said this is "just the beginning," as his proposal will now be open to public comment for 90 days. Pai said eliminating Title II net neutrality rules would return the FCC to a "Clinton-era style of light touch regulation" over the Internet. The Obama-era Title II rules classified Internet service providers as utilities, instead of information services, for the first time in history. The rules subjected ISPs to broad government regulation and rules for how companies can manage traffic over their own networks. Pai said Internet companies have told the commission the rules are "heavy-handed" and "rife with uncertainty." He also pointed to data that show capital expenditure in broadband declined by 5.6 percent since Title II was adopted in 2015, which amounted to over $3.6 billion in lost investment. Pai said this is the first time investment in broadband has declined during a period outside an economic recession. Pai and Commissioner Michael O'Rielly voted to move forward with the proposal, while Commissioner Mignon Clyburn, a Democrat and daughter of Rep. James Clyburn (D., S.C.), voted against. Pai's proposal would also eliminate the "Internet conduct standard," a vague mandate that allows the FCC to investigate ISPs. "With this expansive authority, the FCC could investigate any provider for offering the public virtually any service that the agency might find problematic," Pai said. "And that is, in fact, what the FCC did." "Within months of conferring this new found authority upon itself, FCC met the enemy, consumer friendly free data programs offered by several wireless companies," he said. 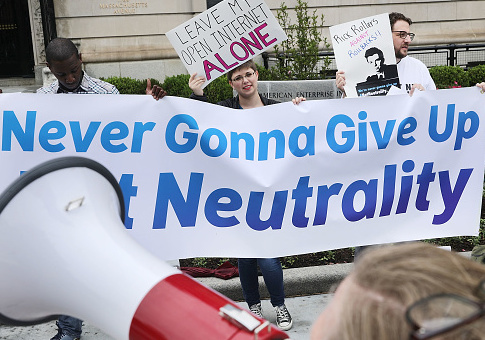 Under net neutrality rules, the FCC began investigating Verizon, T-Mobile, and AT&T for offering packages that allowed customers unlimited streaming of HBO and other channels. Pai ended the investigations after he was elevated to FCC chairman by President Donald Trump. "The FCC is simply seeking comment on these proposals which draw on the Clinton era of a light touch approach," Pai said. Alt-left protesters picketed outside the FCC building Thursday to protest the vote. The protesters, who claim they want a "free and open Internet," held signs advocating to ban conservative news sites. This entry was posted in Issues and tagged FCC, Internet, Net Neutrality. Bookmark the permalink.